The Patriot Supersonic Rage 2 is the perfect solution for those looking for both an ultra-portable form factor and the high performance transfer speeds of USB 3.0. Designed with a rubberized housing, the Supersonic Rage 2 provides excellent protection against wear and tear. With read and write speeds of up to 400MB/s (Read) and 300MB/s (Write), the Patriot Supersonic Rage 2 uses high quality MLC NAND coupled with a state of the art IC controller for excellent performance when working with large file transfers. Utilizing USB 3.0 technology enables the Patriot Supersonic Rage 2 USB 3.0 to outperform USB 2.0 flash drives by up to 10x - a large 2GB file can transfer in mere seconds. 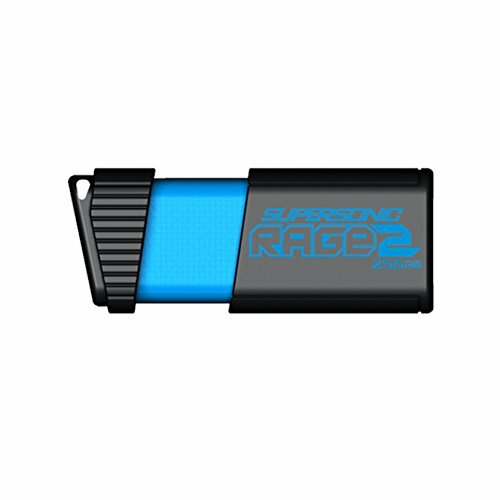 Available in capacities of 128GB and 256GB, the Supersonic Rage 2 offers plug and play compatibility with Windows 8, Windows 8.1, Windows 7, Windows Vista, Windows XP, Windows 2000, Windows ME, Linux 2.4 and later, Mac OS9, X and later. Backed by Patriot's award winning customer support, the Supersonic Rage 2 carries a 5-year warranty.